Happy Thursday, I'm so glad you could stop by! Nothing like combining 3 things into one post - but I promise you, they all fit together. Being Thursday, it's time for Kerry's Three Clover Thursday Challenge, and this week it's using this Sketch. It's a great sketch, one I'll be using again! So what's the Sneak Peek you ask? 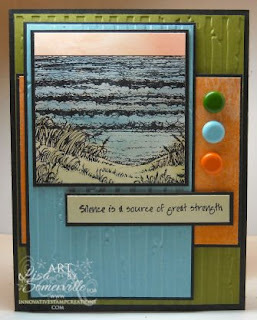 It's the beautiful Serenity image from Innovative Stamp Creations, it's one of the new July Releases. You'll want to stop in on Monday and hop along the ISC Blog Hop, the DT has done some amazing things with the July Release! I'll also have a special treat or two, so be sure to check back! A little bit about my card...The Serenity image is stamped in Black Archival on a piece Spectrum Roll. The Spectrum Roll Technique was done in one of my favorite pads - Pumpkin Patch. After my image was dry, I did morph the technique by adding color to the water and grass using an aquapainter and ink pads. 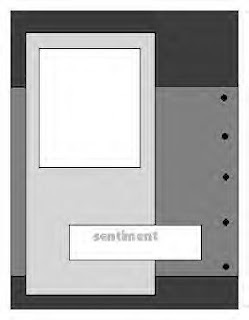 The sentiment from this same sheet is stamped on a scrap piece of Spectrum Roll. For the Baja Breeze and Olive panels, I ran my card stock through the Big Shot using the Distressed Stripes CuttleBug Folder (another one of my favorites). Thanks for stopping by! Be sure to click on the Three Clovers Logo on my side bar to visit the links of Kerry and the other 3CT Challenge team members. Just one more thing before you go...If you missed the Starving Artistamps Blog Hop - click here you'll be amazed at what the Design Team did with the new DoodleFactory release. Beautiful card, I've got those colors saved to try as well. Love those colors together..Your card is super. Beautiful card, Lisa! I love the embossing and colors! And new stamp is gorgeous! this is a beautiful card...and the image youve chosen is lovely.. tfs and Thanks for playing along this week at the cuttlebug challenge blog! WOW Lisa!! That is one beautiful card!! Thanks for playing along with us at Cuttlebug Challenge!! such a beautiful and elegant card lisa! thanks for playing at CBC! good luck with the giveaway! Gorgeous! What a beautiful stamp (I love the ocean) and the way you colored it is so lovely. I also like the Distressed Stripes embossing folder and it looks great on this card. Oh wow Lisa great card and love that image you do such beautiful cards with those type of images. So very pretty, Lisa! Love the sunset you created, and the use of the three different colored brads! Lisa, your card is such a refreshing and calming creation! The image is gorgeous, great job on the challenge1 Thanks for playing along at Cuttlebug challenge! This is just beautiful, Lisa! Love the colors and the texture. How funny we picked the same image and sentiment to reveal today. wow, a beautiful work of art! !..just gorgeous! !..thank you for taking the challenge at Cuttlebug Challenge!! Oh My Gosh! What a gorgeous card! I LOVE the colors but that stamp is over-the-top gorgeous and I just love how you colored it! Love it and I love that you have used the same folder as me. It kinda is appropriate for the challenge, isn't it?